Here I am rigging JOE 101 (Character from ROCQUITA).... trying out a different procedure here from the previous character. In Animate, I painted and symbolized the body parts. 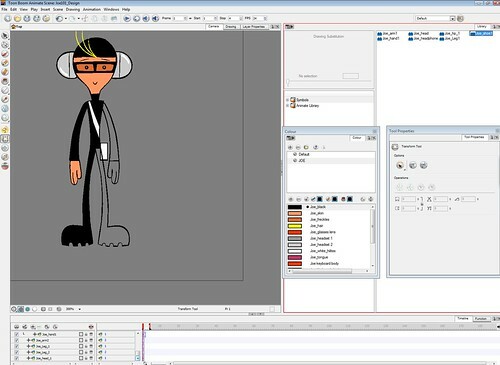 Notice that the headphones, arms, legs... are Symbols which are identified by blue-colored cells in the main timeline. Below is a screengrab of inside Joe 101's HEAD Symbol. In the video below, a demo of Toonboom's Z AXIS (forward <--> behind) in relation to character design and rigging. Insert a keyframe for where the Drawing or Symbol is. 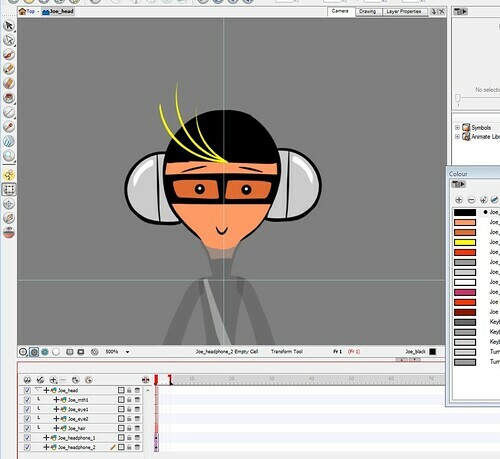 Click on both these tools (lower left of toolbar) - the ANIMATE tool (little person in yellow circle) and the TRANSFORM tool (square thing right below it). These will put you in "Animation Mode". Make sure that the Layer is still selected. Click on the Layer Properties tab up top right - this will show you the X, Y, and Z Axis options. Click on the little button on the right side of the Z Axis line. Drag the cursor thing up and down according to Frame position. Dragging UP = "F" value = forward; Dragging DOWN = "B" value = backwards. Click on Camera View tab to see changes. Eddie: It's the same principle with creating a Multiplane Camera. You can flip symbol without going into it. Use the Flip animation tool, its going to create a keyframe. Hi Sebastien, Thanks! I figured this out :) What I should have done was select the Symbol on the TIMELINE (not the stage). When I selected the Symbol on the stage, the Animation > Tools > Flip options were greyed-out/inactive. Man, that is awesome. Keep up the vids, maybe I'll be forced to buy this.